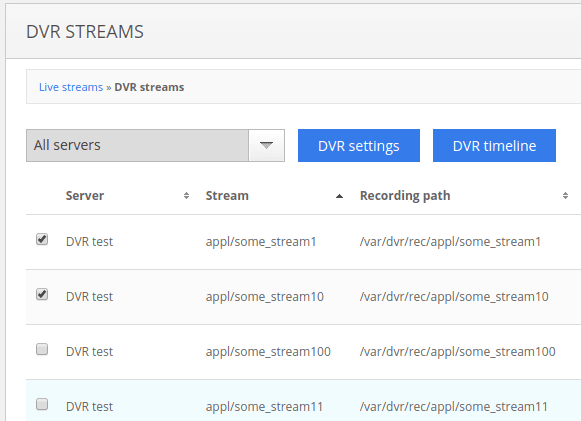 As most of our customers already know, DVR feature set in Nimble Streamer allows recording any incoming live streams and provide playback capabilities for them. It has time range selection and other features. Now we introduce time line browsing and playback. Here's how you can enable and use it. Before using this feature set, please upgrade Nimble Streamer to latest version to make DVR timeline work. You can check Nimble Streamer release notes to see what's the difference between versions. To browse the recorded streams, you need to go to Nimble Streamer -> DVR streams menu. There you'll see the list of recorded streams. To view the DVR steam directly you can click on a question mark on the right side f the list - this will open the sample player dialog showing current playback. To view the timeline of an individual stream, click on a "clock" icon on the right side of a stream row. You will see the timeline dialog which will immediately start obtaining data from Nimble Streamer instance which has that stream archive. This will take a few seconds - not more than a sync-up time which is typically 30 seconds. Once the data is received, the dialog will see full timeline of selected stream's recording. Here you will see green lines which represent recorded fragments - i.e. the time which has recorded data. The blank space shows absence of any records. Date and time selectors allow defining the intervals to view. As soon as you start selecting date or time, the display will immediately move the focus so you'll see how far you've moved. Also, take a look at the navigation bar on top. Previous and Next buttons will move the focus to the points of beginning and the ending of the recorded fragments. Once it moves, you will see red dot at that point. Zoom in and out buttons allow changing the scale of the timeline. You may also scroll with your mouse or touchpad to do the same. You may also drag the timeline by the scale at the bottom of the chart to move between zoomed fragments. Fit timeline button will reset all zoom and scroll to show full archive again. You can play the DVR stream from selected point simply by clicking on it. See Play records from selected point section below for more details. Besides viewing single stream archive, you can browse and compare data from multiple streams. 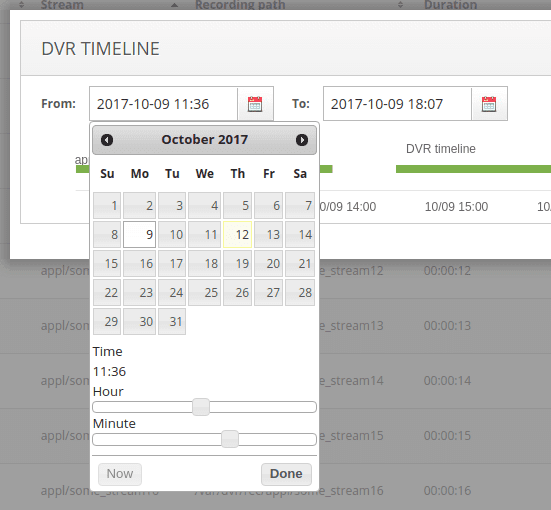 Select required streams by clicking on respective checkboxes and click on DVR timeline button. You will see the same timeline dialog but it will have all streams which you picked up, being shown at the same scale and common range. Here you can do the same operations as you could for single stream. Moving among fragments via Previous and Next button will be done on the common time scale as well so you'll jump between streams according to thier break points. To play the stream from selected fragment, just click on it - see the next section for details. You may click on any point at the timeline to start playback from that moment. When you click you will see the sample player dialog starting the stream from selected time. Here you see the Choose URL to play dropdown list of playback URLs - if you have multiple IPs of your server, you will see streams for all servers. Currently only HLS is supported for fragmented playback. You'll be able to select a player which you'd like to test with this stream and also get the player code by clicking the Show player's code button. And of course you will see the playback of the recorded stream in selected browser from the moment which you pointed it to. The recording will be played until the end of the fragment where you pointed. 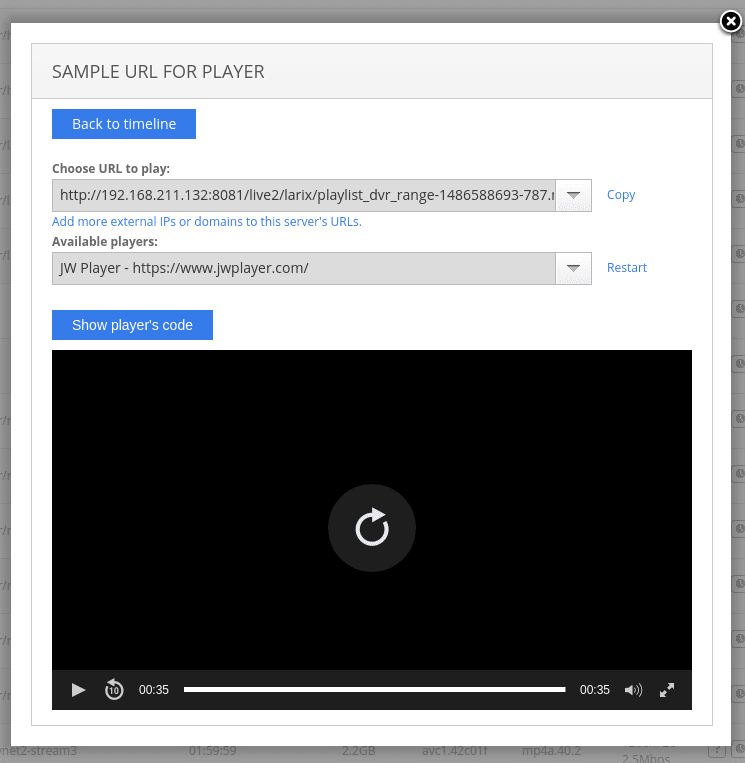 In addition to timeline, you may access DVR stream thumbnails using specific URL to insert into your webpages. That's it - feel free to browse your archives to see what was going on. Let us know if you have any questions regarding this functionality. It would be cool to integrate into a web page for direct client usage. archive information is obtained from Nimble directly using DVR API methods: https://wmspanel.com/nimble/api#toggler=7 So you can use it in order to draw the same chart and embed your own player for playback.